Plexidor Pet Doors: Bacon-biscuits for weekend fun! Has anyone met a dog who doesn't like bacon? Me neither. I prowled the Internet for easy to make dog biscuits the other day, and stumbled onto allrecipes.com. Check out this recipe for bacon-flavored dog treats! Preheat the oven to 350 degrees Fahrenheit and lightly grease a cookie sheet. Beat the eggs in a large bowl. Stir in milk, water, salt, and bacon fat until the mixture is well blended. Stir in the flour gradually until you have a stiff dough. 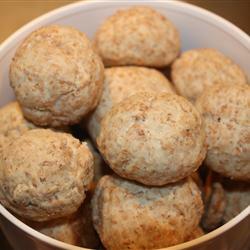 Roll pieces of dough into 2-inch balls. Place on cookie sheet and bake for 35-40 minutes. Cool the cookies on a rack, and store in a covered container in the fridge. If you want to see the original recipe, it is here. I agree completely - if I am to bake something it has to be quick and easy. I like recipes that can still make me feel accomplished and like a good doggy mom, lol! Looks delicious! Luna would love them!